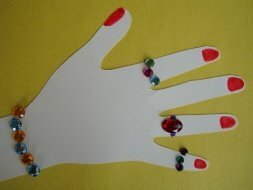 This Handprint Jewels craft is so much fun, and would be a great party craft for any little girl! You can buy a big bag of 'jewels' for a couple of dollars at your local craft store or discount department store! 1. Trace and cut out a handprint, incluing the wrist and upper arm. Glue it on to a piece of construction paper. 2. Make bands for rings and braclets with markers, and glue on your jewels. Color on fancy finger nails, make your own unique design!